“The aim of the funding is to provide Aboriginal and Torres Strait Islander people with access to primary health care services that are culturally appropriate and safe. Belinda Field, Yerin CEO -NACCHO Member : Yerin Aboriginal Health Services Inc. is a community controlled integrated primary health care service located at Wyong on the NSW Central Coast, Darkinyung country. “It’s a special meeting place that should be respected and cherished by the local Aboriginal community. 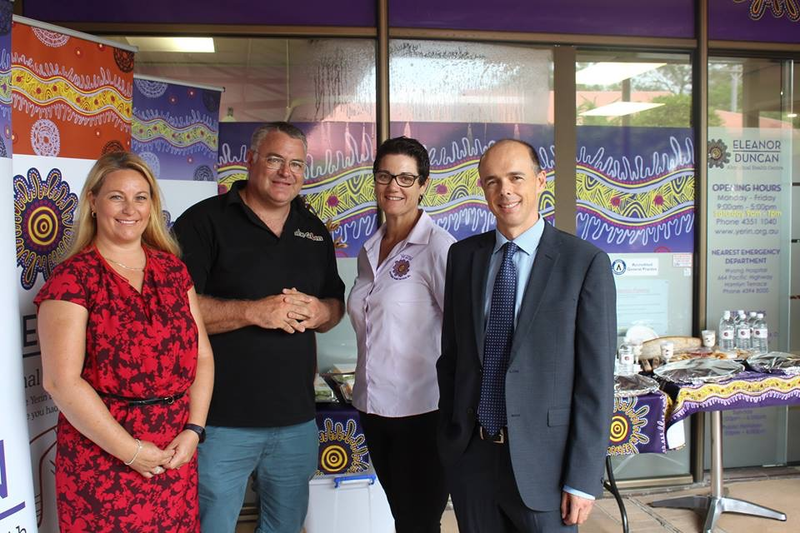 Funding for Aboriginal health services on the NSW Coast are to receive a large boost thanks to significant new funding from the Primary Health Network (PHN). Speaking this morning at the Eleanor Duncan Aboriginal Health Centre Richard Nankervis, CEO for the PHN said” The Primary Health Network is pleased to be providing more than $2.7M in funding to three of the leading primary health care providers on the Coast, namely Ngaimpe Aboriginal Corporation (operating The Glenn), Kamira and Yerin Aboriginal Health Services”. The programs being funded cover a wide variety of primary health care services including care coordination, drug & alcohol rehabilitation and mental health programs such as peer navigation, counselling and suicide prevention. Kamira CEO, Catherine Hewett said, “This new funding is providing us with necessary funds to extend the reach of our services and help us provide more opportunities for Aboriginal women to access quality treatment. We are looking forward to working with more women and helping them build strong relationships with their family and significant others so they have the necessary foundations for a long and lasting recovery”. 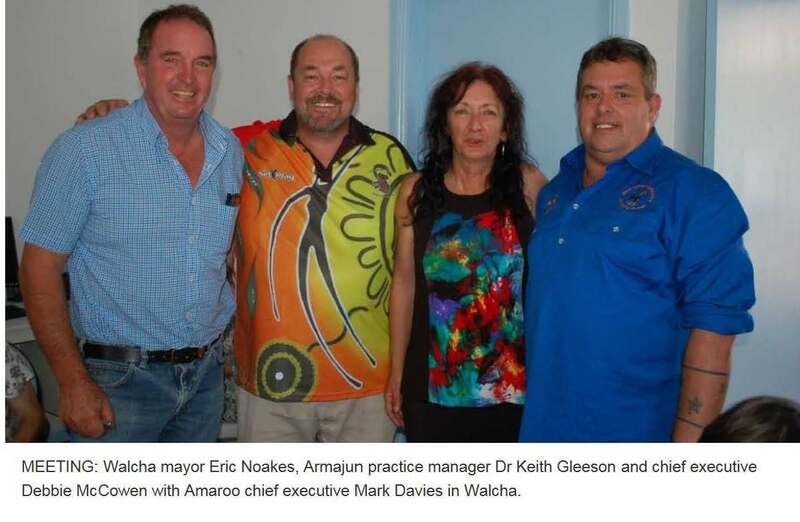 A meeting was held in the offices of Amaroo recently between the Walcha Aboriginal community and two representatives from Armajun Aboriginal Health Service. Armajun chief executive officer Debbie McCowen and practice manager GP Keith Gleeson addressed the group to explain what services Armajun offered and find out what was needed in Walcha. “We don’t believe in telling communities what they need,” said Ms McCowen. Armajun Aboriginal Health Service will be Walcha’s primary health care provider for Aboriginal people in the 2017-2018 year, after receiving almost $2.6 million of federal funding. The Inverell-based company provides medical services out of the old Medicare Local building in Rusden Street, Armidale. Mrs McCowen said the new funding secured Armajun’s services to Armidale and the region. “This means we’re here to stay,” she said. Armajun recently formed a regional advisory committee to inform the Inverell-based board on important local issues. Amaroo chief executive Mark Davies and Kerry Griffin will represent Walcha. The federal government cut more than $2 million from Aboriginal health provider, HealthWISE’s budget. HealthWISE New England North West had been servicing more than 7500 Aboriginal and Torres Strait Islander people in the region with about $2.6 million of Commonwealth funding. But late last year the government announced HealthWISE would only receive $477,053 for the 2017-2018 year. “The level of funding received is insufficient [for us] to continue the same level of services across the region,” chairwoman Lia Mahoney told Fairfax Media at the time. Meeting attendees raised concerns regarding the inadequate transport service between Walcha and Armidale. While Mr Davies queried whether a doctor who only treated Aboriginal patients would become an issue in the community, the mayor, Eric Noakes, and other attendees said it would not. Dr Gleeson said they would not do anything without the agreement of other medical services in Walcha. Dr Gleeson described an Aboriginal controlled health service as a contemporary sacred site. Its a place of learning , wellbeing and healing. And it belongs to you, the mob. It’s worth protecting,” he said. Have you got a similar good news story about one of our ACCHO members ? 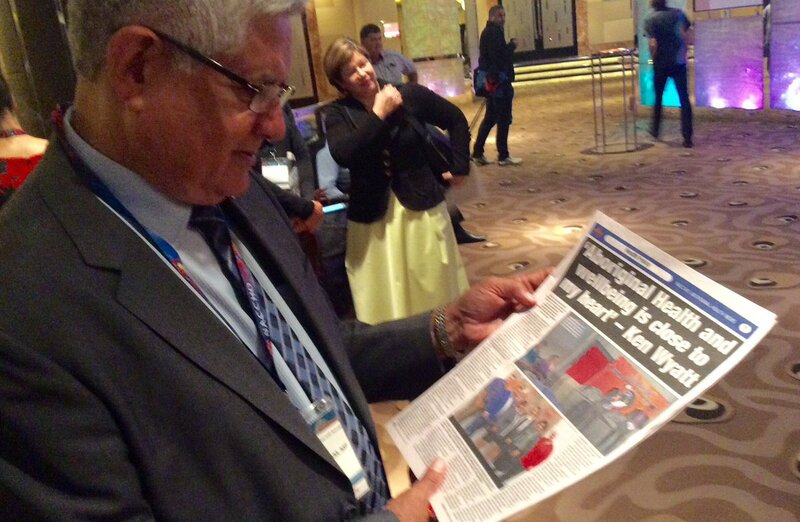 NACCHO has announced the publishing date for the 9 th edition of Australia’s first national health Aboriginal newspaper, the NACCHO Health News . Working with Aboriginal community controlled and award-winning national newspaper the Koori Mail, NACCHO aims to bring relevant advertising and information on health services, policy and programs to key industry staff, decision makers and stakeholders at the grassroots level. And who writes for and reads the NACCHO Newspaper ? While NACCHO’s websites ,social media and annual report have been valued sources of information for national and local Aboriginal health care issues for many years, the launch of NACCHO Health News creates a fresh, vitalised platform that will inevitably reach your targeted audiences beyond the boardrooms. NACCHO will leverage the brand, coverage and award-winning production skills of the Koori Mail to produce a 24 page three times a year, to be distributed as a ‘lift-out’ in the 14,000 Koori Mail circulation, as well as an extra 1,500 copies to be sent directly to NACCHO member organisations across Australia.